The next round of The Roof That Jack Started Lotto will start September 16, 2015. Have your $10 in by September 14th. Q. 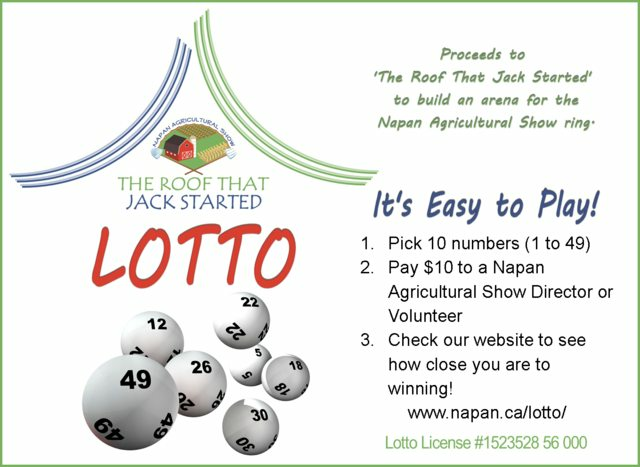 Why does the Napan Agricultural Show have the Lotto? A. To help finance the project "The Roof That Jack Started". Q. Why do we have this project? A. In 2012, when Jack Walsh passed away in Alberta, he designated the Napan Agricultural Show as one of the organizations that you could donate to. The Napan Agricultural Show looked at what we could do with these funds. Years before his passing, Jack encouraged us to start putting a roof over our present ring. When the building committee checked this out, the cost of putting a roof over the ring and location of our ring being too close to the community centre, this was impossible. A new building will come in the form of an indoor arena. This would allow us to host the Napan Agricultural Show, as well as other events throughout the year, such as concerts, other horse shows, musical rides, barrel racing association, etc. The general public would also be able to rent the facility. Q. How is this possible? A. The building committee has put together plans with the help of professionals and is now available to the general public to see. Q. How much do you have to raise? A. Our five year goal is to raise $100,000 and work getting partners to help us fund the total coast of $400,000 to $500,000. Q. How can I get in on this fundraiser? A. Contact any member of the Napan Agricultural Show to give your form to them or drop the form and your payment to Speedy Glass in Chatham or at 99.3 The River in Newcastle. The cost is $10, you pick ten numbers between 1-49 and fill out the form. The prize is half of the money that is collected. Q. What else is happening to finance the project? A. Breakfasts, bake sales, poker ralleys, suppers, yard sales, 50/50 draws and more to come. Q. Who do I contact to find out more information about the Roof That Jack Started project?